11 February 2019, Makati Philippines – BDO Unibank, Inc. (BDO), the country’s largest bank, listed on the Philippine Dealing & Exchange Corp. (PDEx) its maiden issue of PhP 35 Billion which marks the largest amount ever issued and listed through a single security. PDEx President and COO Antonino A. Nakpil complimented BDO’s active participation and commitment in developing the capital market. 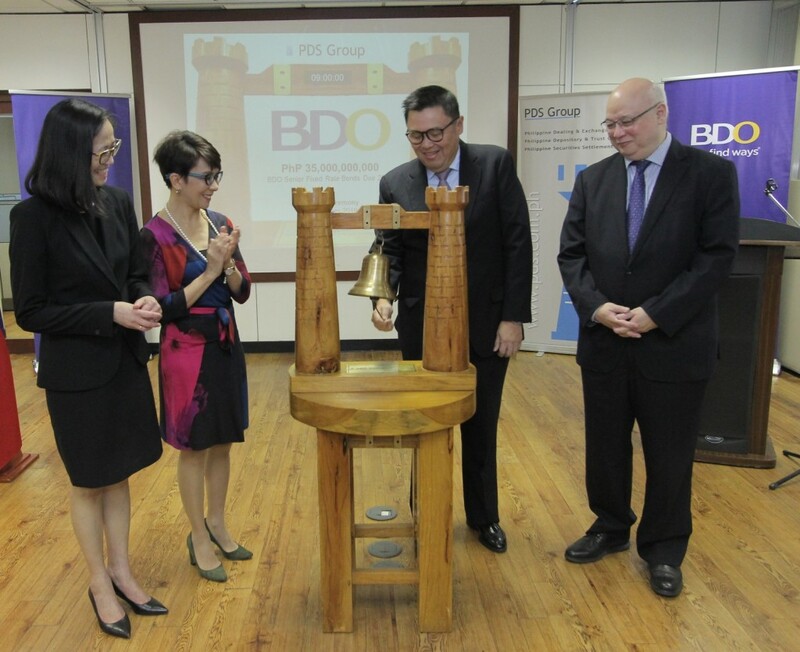 He said that “first and largest” is consistent with BDO’s activities over the past 15 months in the USD-denominated segment of the capital markets, as it was the first Philippine bank to issue a USD-denominated Green Bond. “We understand that, to date, it also holds the record for issuing the largest USD-denominated Regulation S bond offering,” said Mr. Nakpil. With this bond listing, the SM group of companies’ cumulative level of outstanding securities listed on PDEx stands at PhP 226.02 Billion, representing 21% of the total of PhP 1.099 Trillion of Corporate Fixed-Income instruments listed in the organized market. While this listing year started just this month, this second listing has already set the volume of new listings to PhP 50 Billion, a 100% increase from the same period last year. BDO is the fifth bank to issue bank bonds in the PDEx bourse, bringing the total volume of bank issues listed on PDEx to PhP 299.09 Billion. The event was held at the PDS Group Assembly Hall and was also graced by the Issue’s Sole Arranger, Bookrunner, and Market Maker Standard Chartered Bank led by CEO Lynette Ortiz.